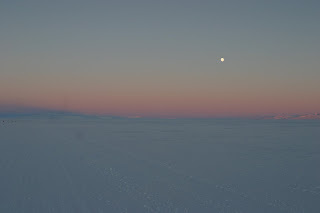 BIV (blue, indigo, violet) over the Ross Ice Shelf. 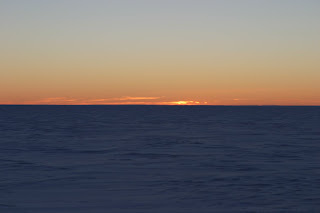 A few days ago on April 21, I saw the last full sun dip below the horizon. 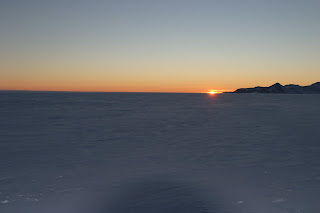 We had a couple sunsets after this, but the sun never came fully above the horizon on those days. They were still beautiful, but different. I'll have pictures of those up soon. 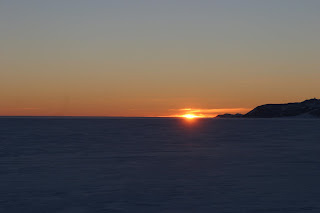 For many people, this was their last sunset because the final two sunsets weren't visible from town. The last full sun dipping behind the horizon. I'm going to miss my sunny friend. I live off sunshine. Every day over the winter in Colorado, I would cut out at lunch to run or bike so I could get my fill. Driving to work in the dark and coming back in the dark without playing in the sunshine just doesn't cut it. I'm really curious how this winter will effect me. A lot of people have full spectrum bulbs to get some fake sunlight, but I don't know if it will be the same. Just in case, I'm doing my morning reading in a light room that they have set up to give everyone the full spectrum light they need. Pegasus Field and Mt. 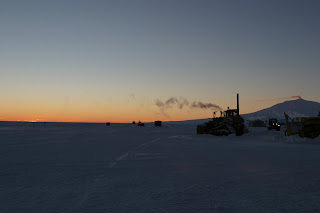 Erebus move into another night. A little taste of home, a little taste of wine.